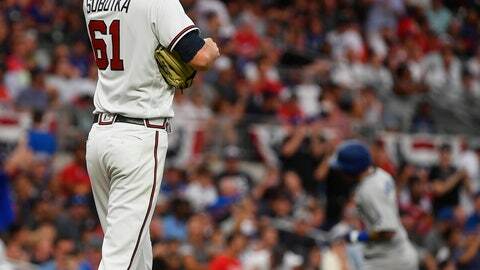 The Baby Braves ran out of steam in the NL Division Series, falling to the Los Angeles Dodgers 6-2 on Monday. Manny Machado delivered the crushing blow, a three-run homer in the seventh inning against Chad Sobotka, a rookie who made Atlanta’s postseason roster despite appearing in only 14 regular-season games. Los Angeles won the series 3-1. The Braves scored a combined two runs in their three losses. Sobotka was the second straight rookie reliever, after Max Fried, used by manager Brian Snitker in the game. The Braves lost their ninth consecutive playoff series since sweeping the Astros in the 2001 division series. Still, the team has good reason for optimism after improving from 90 losses in 2017 to win their first NL East title since 2013. The Baby Braves enjoyed their postseason moment in the spotlight Sunday night, when 20-year-old rookie Ronald Acuna Jr. became the youngest player to hit a postseason grand slam and rookie Touki Toussaint earned the win in relief. The 6-5 win kept the Braves from being swept in the series. But the kids certainly had their struggles. Acuna’s slam was a highlight, but he batted just .188. Ozzie Albies hit .200 and appeared to miscommunicate with right fielder Nick Markakis on Yasiel Puig’s popup Monday. Johan Camargo was hitless in the series. There was obvious disappointment in the Braves clubhouse. “We didn’t win the World Series. It’s a lost season in my book,” Freeman said. Snitker said the young players will benefit from their first postseason. The veterans weren’t much of a help, either. Markakis had one hit in 12 at-bats, and Inciarte was 3 for 14. Reliever Jonny Venters created a jam that allowed David Freese to deliver a pinch-hit, two-run single off Brad Brach in the sixth Monday. Even Freeman, an All-Star, couldn’t match his usual production, going 4 for 16 with a homer. Atlanta’s thin bench was a glaring disadvantage, especially when compared with the Dodgers’ impressive depth. Kurt Suzuki, pinch-hitting for Braves starting pitcher Mike Foltynewicz, gave Atlanta the run with a two-run single off Rich Hill in the fourth . But Snitker’s other options on a thin bench included Ryan Flaherty, who hit .217 in the regular season, Lane Adams, Lucas Duda and backup catcher Rene Rivera. Duda just missed hitting a three-run homer off Kenta Maeda in the eighth, pulling the deep blast foul, before ending the inning with a fly ball to center. Atlanta’s depth took a hit when shortstop Dansby Swanson was left off the postseason roster with a hand injury. Charlie Culberson, normally a utility player, was forced into a starting role. Culberson was 1 for 4 on Monday and hit only .167 for the series.